Google recently held their annual keynote event 'Marketing Innovations Live' and discussed current hot topics and trends, they also introduced a range of new products and went into more detail about their recent announcement that Google will be retiring AdWords and DoubleClick. Don't worry if you missed it, we've created this quick roundup of the key take-aways and what this means for businesses. Optimised Ad Rotation: According to Google, this system drives performance by ensuring that priority is given to the ads that are predicted to perform the best within an ad group. This is based on Google's machine learning algorithm that is able to determine which ads should perform better than others. Smart bidding: This technique factors in signals regarding the intent and context of the ad while optimising the bids in real time! Responsive Search Ads: Google seemed particularly excited by this one... Responsive Search Ads are able to deliver better results due to their simplicity and flexibility, making the ad creation and testing process much easier. These ads find the best possible combinations through machine learning, the ads switch various headlines and descriptions until they find the perfect combination, offering up to 90% more text and making it easier to tailor messages and makes them more unique. If you haven't optimised your site for mobile you're definitely losing out. Google had some big announcements and tips on how to take advantage of the growing number of mobile users! Mobile Landing Page Speed Scores: This new feature in Google Ads uses a 10-point scale to determine the speed of your landing pages on mobile. Google's Anthony Chavez explained that this is determined based on the page speed and potential conversion rate, allowing you to prioritise which landing pages to optimise first depending on the speed. This is also updated on a daily basis, meaning that as time passes you can track your optimisations and see how far your page speeds have come! AMP (Accelerated Mobile Pages): Again, this is another useful feature of Google Ads as it's supported natively within the platform, and enables the user to "super-charge" their mobile site speed. It seems pretty obvious, but as Google pointed out, a better landing page is going to deliver better results... we have our own deck discussing AMP strategy - get your copy here! Cross Device Reporting and Remarketing: This prompted cheer and applause from the audience, by combining data from users who have visited a site multiple times, this feature gives you insight into user behaviour regardless of the device they're using. Linking different moments together and revealing trends that you wouldn't have been able to identify previously, we now have the ability to understand consumer behaviour across channels. This will help marketers make better decisions by helping them understand the holisitic customer experience. 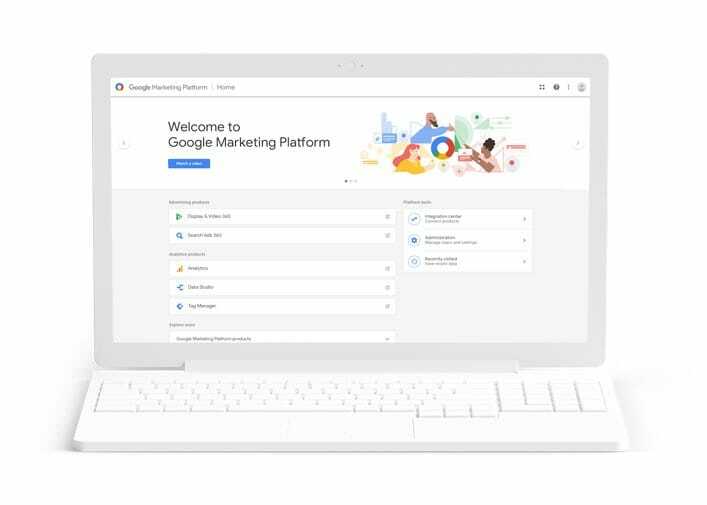 Google's new platform houses advertising and analytics under one roof, giving you the tools needed to optimise user experience all in one place. The platform offers Analytics 360, Optimise 360, Data Studio, Surveys 360, and Tag Manager 360. DoubleClick, which has been one of Google's strongest product brand since 1996, will also be retiring their products and will become a part of the Google Marketing Platform. The move comes as Google look to re-brand, focusing on being more transparent and trustworthy, while also being able to offer more choice in terms of how we chose and buy media, but also in terms of how we measure it. This is why they have decided to merge DoubleClick products and Google Analytics 360 Suite together, forming the Google Marketing Platform. As a current DoubleClick (DC) partner, we won't be removing our DC tags from our client's websites anytime soon - the platform will still remain, but this will soon come under the Google Marketing Platform. This doesn't mean the technology has changed, just where it is housed, and it will still empower quick decision making and allow us to achieve great results for our clients. Other features include Search Ads 360 which helps you plan, buy and measure search ads on Google and other search engines, and this is also the replacement for DoubleClick Search. Display and Video 360 is a feature that allows to manage Display, Video, TV, Audio and other advertising channels all in one place. Finally, the Integration Centre gives you the ability to integrate products and features in just a few clicks and allowing you to share insights. While you're waiting to get your hands on this new platform, register for your free Google AdWords (soon to be Ads) health check. Our experts will enhance your digital performance, discovering areas for improvement and the opportunities yet to be taken advantage of.